Background: Cerium oxide (CeO2) nanoparticles have been posited to have both beneficial and toxic effects on biological systems. Herein, we examine if a single intratracheal instillation of CeO2 nanoparticles is associated with systemic toxicity in male Sprague-Dawley rats. Methods and results: Compared with control animals, CeO2 nanoparticle exposure was associated with increased liver ceria levels, elevations in serum alanine transaminase levels, reduced albumin levels, a diminished sodium-potassium ratio, and decreased serum triglyceride levels (P < 0.05). Consistent with these data, rats exposed to CeO2nanoparticles also exhibited reductions in liver weight (P < 0.05) and dose-dependent hydropic degeneration, hepatocyte enlargement, sinusoidal dilatation, and accumulation of granular material. No histopathological alterations were observed in the kidney, spleen, and heart. Analysis of serum biomarkers suggested an elevation of acute phase reactants and markers of hepatocyte injury in the rats exposed to CeO2 nanoparticles. Conclusion: Taken together, these data suggest that intratracheal instillation of CeO2nanoparticles can result in liver damage. © 2011 Nalabotu et al, publisher and licensee Dove Medical Press Ltd. This is an Open Access article which permits unrestricted noncommercial use, provided the original work is properly cited. Nalabotu SK, Kolli MB, Triest WE, Ma JY, Manne NDPK, Katta A, Addagarla HS, Rice KM, Blough, ER. (2011). 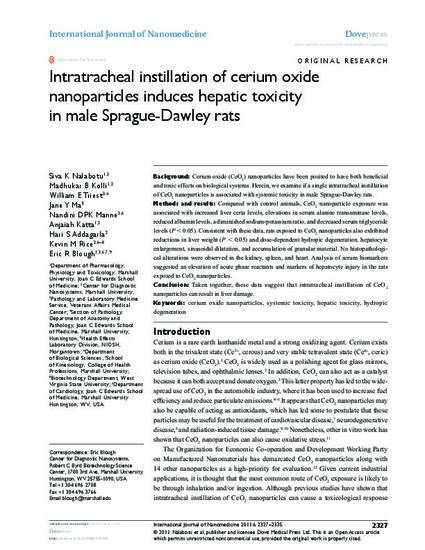 Intratracheal instillation of cerium oxide nanoparticles induces hepatic toxicity in male Sprague-Dawley rats . International Journal of Nanomedicine, 6(1), 2327-2335.